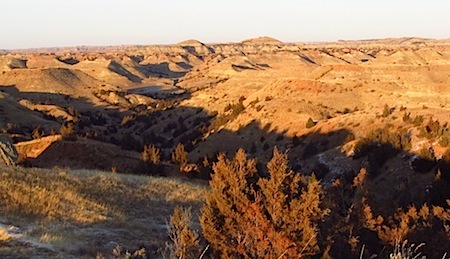 MEDORA, ND — Buck Hill is one of the tallest points in Theodore Roosevelt National Park, which spreads across more than 70,000 acres of grass and tight canyons where North Dakota meets South Dakota and Montana. Several weeks ago Valerie Naylor, the park superintendent, hiked to the summit and counted six oil drilling platforms within eyesight. That, of course, is like describing the head-on collision between a semi and a Volkswagen as a course correction that went unheeded. About five years ago, the Department of Energy issued a projection for energy demand that predicted the United States would need to produce 40 percent more energy by 2050 to sustain the life of choice and mobility that Americans have come to expect. More than a year ago, in remarks to a gathering of Congressional staffers, journalists, researchers, and non-profit leaders in Washington, I noted that achieving that increase — which amounts to nearly 3 billion more barrels of oil annually, 400 gigawatts of electricity, 400 million metric tons of coal, 9 trillion cubic feet of natural gas — may be possible. But getting there would produce lasting scars on the land, reckless damage to rivers and lakes, more air pollution and climate changing gases, and incalculable risks to forests, grasslands, and America’s wild places. Such consequences, while discouraging to conservation-minded Americans, also aren’t much of an impediment to a nation that consumes almost a quarter of the Earth’s available oil, heats and cools its homes to an even 70 degrees Fahrenheit, and is learning here in North Dakota and a dozen other states just how many good paying jobs are connected to the most massive energy exploration and production surge in U.S. history. Fortunately, drilling will not occur inside the park, which is home to cougars and a wild bison herd. (See pix above). U.S. National Park Service policy forbids oil and gas exploration in any national park, so all production activities are occurring beyond the park’s boundaries. 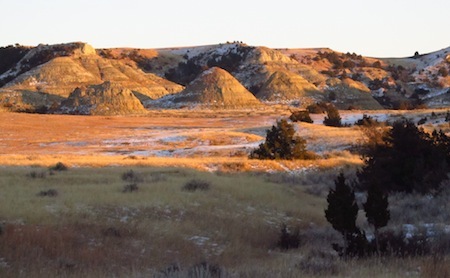 The same can’t be said for the Dakota Prairie National Grasslands, a 1.259 million-acre stretch of wildlands in southwest North Dakota and northern South Dakota. 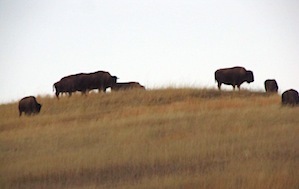 The grasslands are administered by the U.S. Department of Agriculture, which is busy leasing federal minerals and preparing permits for at least 90 drill sites. Federal land managers hold operators to more rigorous production practices than state regulators. That idea is off the table now, and will remain so for generations. The Bakken formation in North Dakota and Montana, and its related Three Forks and Tyler shales in North Dakota, Montana, South Dakota and Wyoming are said by geologists to contain nearly 30 billion barrels of recoverable oil. Landmen, the advance guard of the industry, are swarming county clerk offices to lock up private mineral leases. Drilling rigs are poised to advance into South Dakota in the spring. Another deep shale layer, the Niobrara, extends from northeastern Colorado into Wyoming. Early production reports indicate that the Niobrara, which looks to be nearly as big and productive as the Bakken, is capable of yielding 500 to 1,200 barrels per well per day. In Utah, oil and gas production is occurring with accelerating urgency in the shale of the Uinta basin in the state’s northeast region. In Oklahoma, exploration and production is picking up in the Granite Wash region, and the Anadarko. Kansas is seeing new drilling activity. The old Permian Basin of west Texas and southern New Mexico is being reworked with new technology. And there are nearly 200 drilling rigs, almost as many as operate here in North Dakota, that are actively developing the Eagle Ford shale in southeast Texas. And this is just a partial list. Texas also has big natural gas plays in the Barnett and Haynesville shale, which extends into Louisiana. The Utica shale in Ohio looks to be a big oil and gas producer. And the Marcellus shale in Pennsylvania is turning that state into a major natural gas producer that could also see a revival of big chemical and steel manufacturing plants because of the competitive cost of energy. Economic Modeling Specialists, Inc., an 11-year-old analysis and research firm based in Moscow, Idaho, just completed a study of the fastest growing job sectors in the United States from 2007 to 2011. Using federal Bureau of Economic Analysis and Bureau of Labor Statistics data, the 50-member firm found that three of the top five fastest growing jobs, and nine of the top 15, were related to the oil and gas boom occurring nationally. The study also points out that the new jobs pay well, which accounts for the wave of population growth in North Dakota, a state that had been losing people for decades. Next PostNext Is American Energy Exploration and Production Breaking the Great Recession?